Why the limit must be lower | What Car? The current drink-drive limit of 80mg per 100ml of blood was introduced nearly half a century ago, when spending the evening at the pub and then driving home was a socially acceptable thing to do. It was a bold move by the government of the day, and it paid off in its first year the new law helped slash the percentage of road deaths related to alcohol from 22% to 15%. Times have changed, though. Cars are safer, road layouts are much improved and speed limits are better monitored. These advances have helped cut road deaths by two thirds, despite a three-fold increase in traffic, so it's incongruous that the drink-driving law remains the same as it was in 1967. 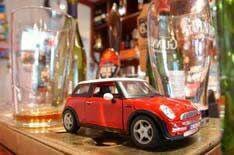 UK drivers can get behind the wheel after drinking more alcohol than anywhere else in Europe bar Malta; nearly all our European neighbours have a drink-drive limit of 50mg/100ml. So, why do we encourage drivers to drink at all? Who supports a zero limit? What Car? believes the limit should be even lower 20mg/100ml or effectively zero. So why 20mg? Some medicines, mouthwashes and food contain tiny amounts of alcohol, so 0mg/100ml wouldn't really be workable, but a limit of 20mg/100ml is such a low figure that the only way to be sure that you hadn't breached it is to drink nothing at all. We're not the only ones who think so. Road safety charity Brake agrees that the limit should be slashed. 'Drink-drivers take risks with their own lives and those of others, so Brake supports What Car? 's call for a 20mg/100ml blood-alcohol limit,' said a spokesman. There's a mountain of evidence to suggest that drivers with alcohol in their bloodstream are less safe than those who have had nothing to drink. The National Institute for Health and Clinical Excellence (NICE) estimates that drivers are six times more likely to be killed in a car accident with a blood-alcohol level between 50mg and 80mg/100ml than when sober. The risk of death is still three times higher between 20mg and 50mg/100ml. Our own simulator research showed why; average reaction times were 3% slower at 50mg/100ml than when sober and 8% slower at 80mg/100ml. It's no wonder, then, that the Government is under increasing pressure to reduce the legal limit. A report by Sir Peter North commissioned by the previous Labour administration called for a 50mg/100ml limit, and estimated that it would save 168 lives in the first year, rising to 303 lives annually after six years. The call is backed by a number of influential organisations, including the Association of Chief Police Officers (ACPO), The Royal Society for the Prevention of Accidents (RoSPA) and the AA. Falling in line with Europe and lowering Britain's limit to 50mg/100ml is certainly the easy option for the Department for Transport (DfT). However, it isn't the right one because it would still send the message that it's okay to drink 'some' alcohol then drive. Our own research at the TRL clearly illustrated this. Our four volunteers each consumed vastly different amounts to get to them to the current 80mg/100ml limit. One required a full 12 shots of vodka to get there, and it wasn't simply the smaller the person the less they needed to drink: our 12-shots man is only 5ft 7in tall and weighs just 12 stone 4lb.